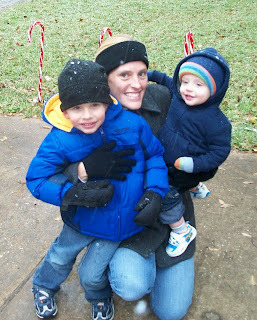 We went to Dallas recently to celebrate Christmas with my family. 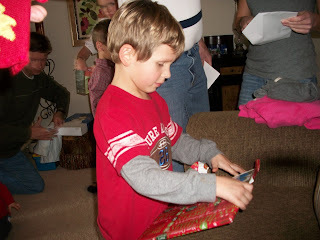 It was great to spend time with our extended family and Dawson and Brady received lots of fun gifts. 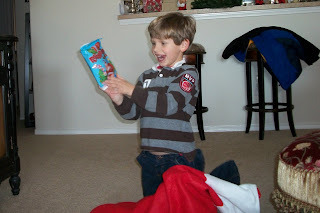 Dawson thrilled to get ring pops in his giant stocking. 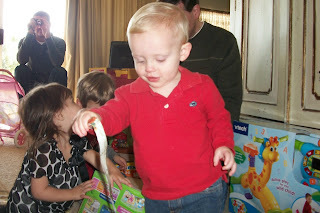 Opening a present from Gramps - a huge Imaginex dragon castle, which he's spent many hours playing with already. Opening a book from Chance and Caseyln. 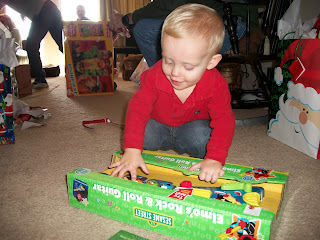 Brady pulling the wrapping paper off one of his presents. 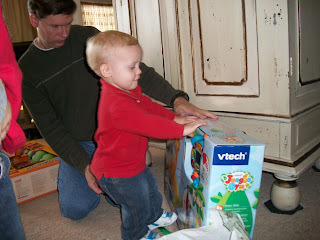 Brady investigating a fun new v-tech toy from Gramps. Playing with his Elmo guitar. 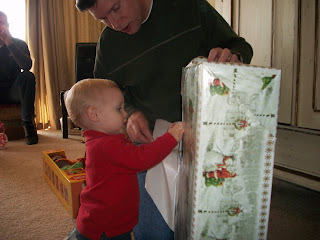 Brady entertained with a strip of wrapping paper. 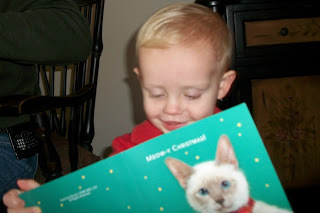 Brady loved this musical card - cats meowing a Christmas song. Still playing with his music card. 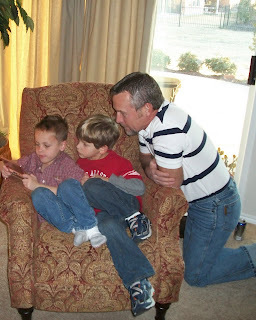 Dawson and Gramps watching Chance play one of his new Nintendo games. 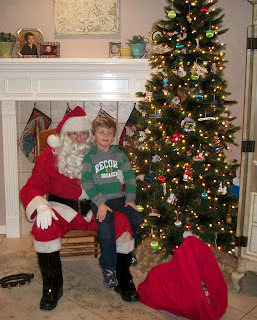 Dawson enjoyed a special appearance by Santa at a friend's Christmas party. 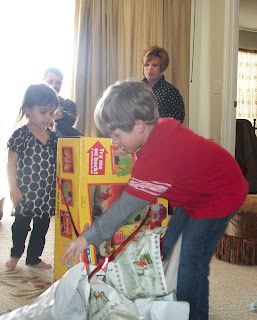 Accepting the gift that Santa pulled out of his bag. 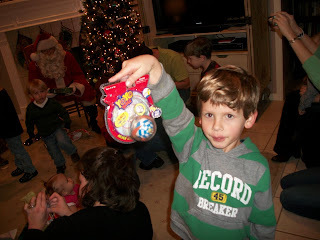 Showing me his new yo-yo. 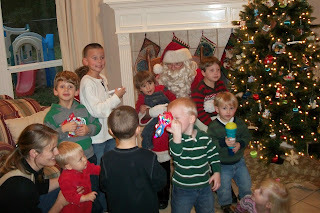 An attempt to get a group picture of all the kids with Santa - as you can see, it didn't work out very well. 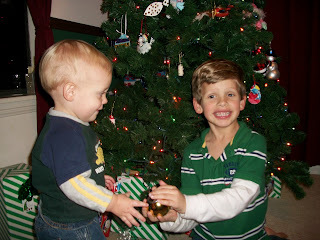 They were all excited about their presents and didn't want to stand still for another picture. 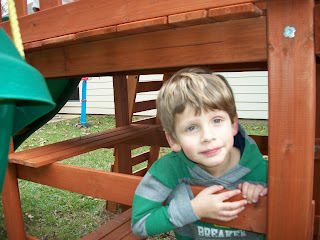 Dawson really enjoyed this cool playground at a friend's house. Looking out the window of the fort. Swinging very high. 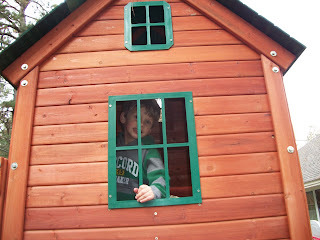 This was the first time Dawson swung by himself for so long - he even got started all by himself. 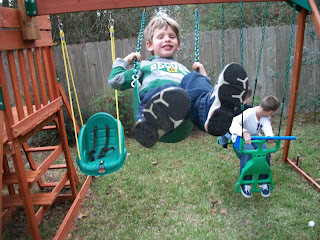 He was so proud, he kept swinging and swinging. 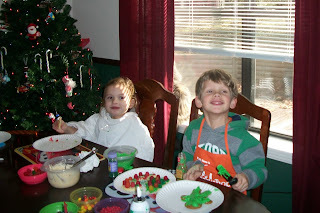 We had a few friends over for some fun cookie decorating. 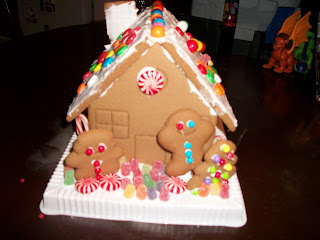 Hopefully this will be an annual tradition - it was so fun! 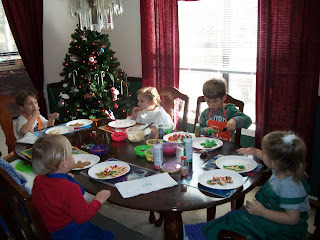 All the kids decorating and eating their cookies. 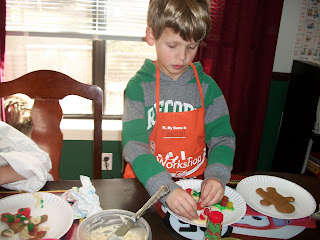 Dawson putting tons of dots on his cookies, which he later realized made them too sugary. 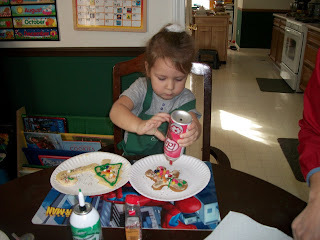 Hannah and her beautiful cookies. 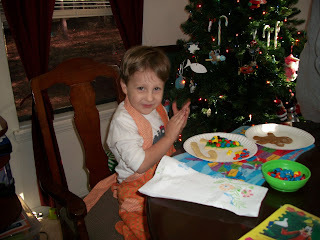 Seth and his great M&M Christmas tree. 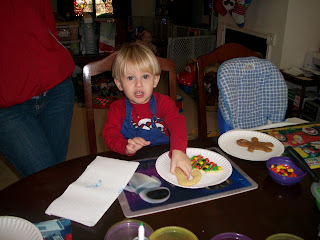 Cute Cy showing me his cookies. 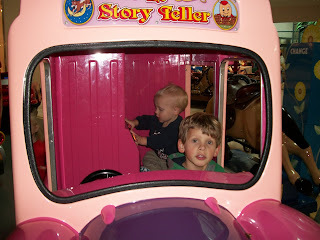 Kaelin and Dawson having a good time. 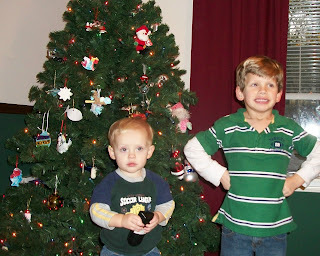 I tried valiantly to get a picture of both boys in front of the Christmas tree, looking at the camera, and smiling for our Christmas card picture, but it didn't work out. Maybe next year. 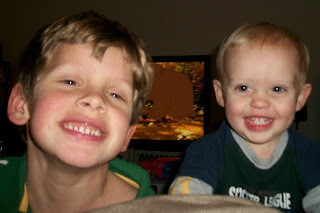 Dawson with a smile glued to his face so he would be ready when I took the picture, but Brady refused to cooperate. Brady not very happy about me thwarting his effort to run and play; Dawson still being a good sport, but beginning to grow tired of trying to get the perfect picture. Hey, they're both smiling!! Wish they would have been closer together, but this will do. 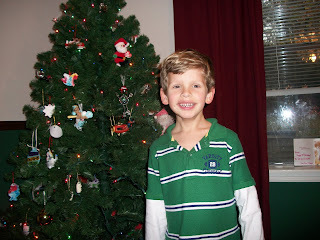 This was one of our Christmas card pictures. 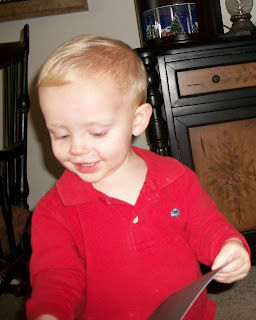 Another video of Brady dancing to a music card. 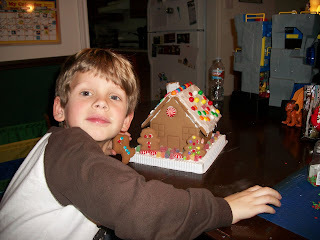 He is so cute!!! 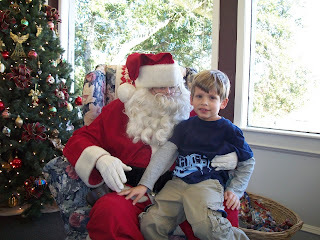 We continued a family tradition this year by having breakfast with Santa. 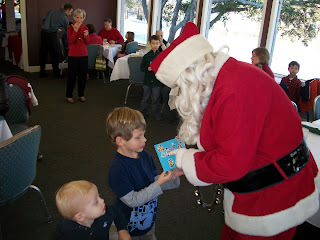 It's a fun atmosphere, great food, and an opportunity for the kids to visit with Santa and get a special treat bag from him. 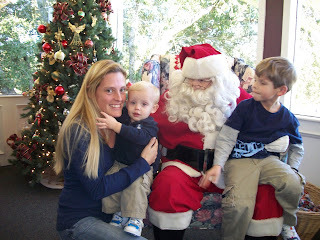 Dawson was very interested in Santa, Brady was mildly amused, but did not want to relinquish his grip on me to sit in his lap. 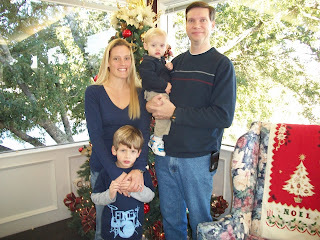 A family picture in front of the tree. 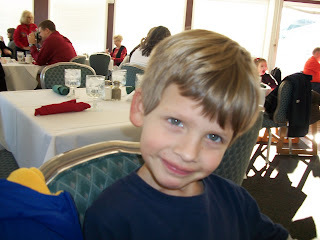 Dawson smiling sweetly while we waited at the table. 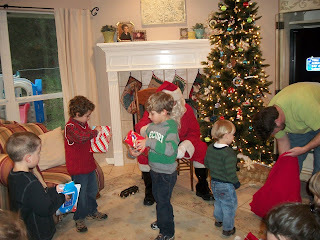 Dawson showing Santa his sticker sheet. 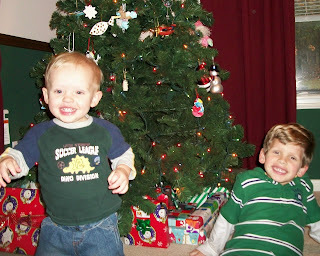 Our attempt to get a picture of both boys with Santa. 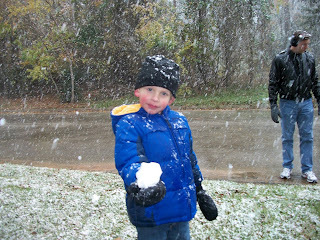 We had a rare winter event in Huntsville - a snow day!! 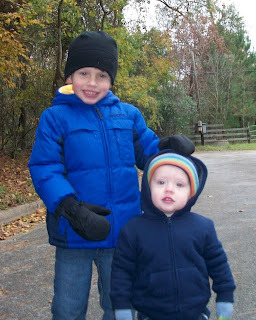 It was fun to bundle up and go play in the snow. 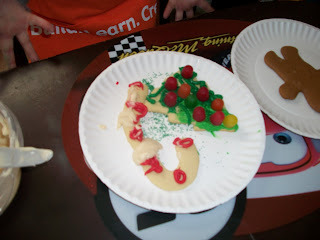 What a treat for our kids! 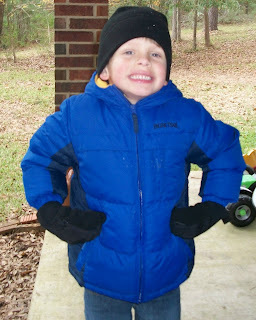 Dawson looks so cute in his winter clothes! Me with my two cuties. 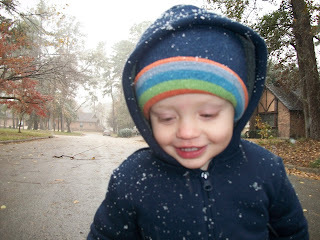 Brady smiling as the snow falls on him. 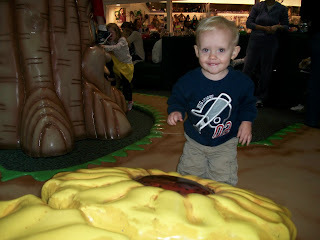 On a recent cold day, we went to The Woodlands for some fun indoor play at the mall. 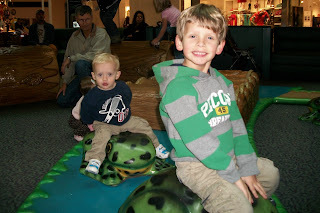 Dawson and Brady sitting on the frogs in the big tree play area. Brady smelling one of the big flowers. He "smells" by blowing out through his teeth - it's so adorable. 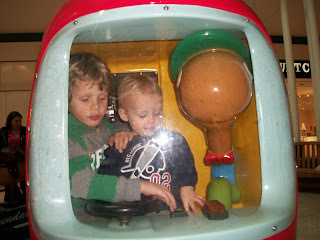 Playing in the ice cream truck. 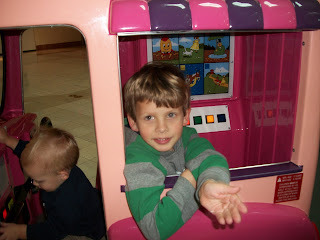 Dawson is waiting for me to pay before he'll give me my ice cream cone. Still in the ice cream truck. 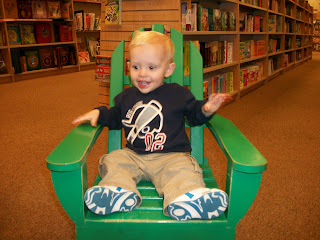 Brady so cute sitting in the little chair at Barnes & Noble.